US, 2014, or 132 minutes, Colour. Bradley Cooper, Sienna Miller, Ben Read, Jake Mc Dorman. Clint Eastwood, in his own films and in those he directed, has taken us into many war zones, especially in his early years, in the American West and in the police and detective world. In the 1990s, he made Heartbreak Ridge, about American invasions in the Caribbean. But his main war impact was in his treatment of American patriotism in Flags of our Fathers and then looking at the other side of the Pacific battles, Letters from Iwo Jima. Eastwood offered both sides of the war effort, the battles, the strategies, the tactics, the patriotic feelings, both American and Japanese. With this background in mind, he has now made American Sniper – released when he was 84. The film is based on an actual character and actual events, especially in Iraqi after 9/11. Chris Kyle was a sturdy Texan man, the film offerings glimpses of his childhood, his father taking him hunting, training him to kill with accuracy, but also instilling him and his brother with a sense of knowing who were sheep, needing protection, wolves, the bullies, and the sheepdogs, those prepared to care for and defend the sheep. He wanted that role for his sons. In adult life, Chris and his brother were rodeo riders but, after the news about the massacres by Al Qaeda in Tanzania and Kenya in 1998, Chris enlists and goes through the rigorous training for Navy SEALS. This is captured visually in a collage of moments of training. A bulked-up Bradley Cooper gives one of his best performances as the intense sniper, loving his wife and family, but more at home with his comrades in arms and in action in war. 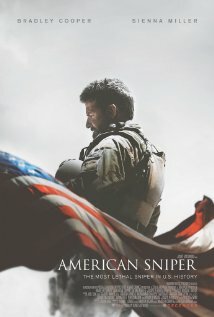 Besides the sniper action, with which the film opens and then leaves unfinished for about 30 minutes, there is the flashbacks story of Chris Kyle, his meeting Taya (Sienna Miller) in a ba, pleasant repartee, phone calls, dating, engagement, marriage, her pregnancy – but then he is sent to Iraq after 9/11. The action sequences are quite strongly staged and acted, with Kyle and his skills as a sniper, his accuracy, the number of kills, and his getting a strong reputation with the nickname, Legend. There are scenes of door-to-door knocking to search out insurgents. There are confrontations with local leaders, especially a cruel man nicknamed The Butcher. There is a tense scene where a young boy who picks up a weapon after a man is killed in the street, looking as if to fire it, with Kyle watching, hoping that the boy will drop the weapon and not fire it so that Kyle will not have to shoot him. Kyle had four tours in Iraq. While it did not take a physical toll on him, it took a psychological toll which he could not appreciate, saying nothing was wrong with him, mouthing patriotic statements about defending his country. But, on his return, he could not fully relate with his wife emotionally which then took its toll on her, especially as at times, he phoned her and action came on the line immediately, she listening to it in dismay. Dramatically, the film builds up to an engagement which involved an insurgent sniper, Kyle having to make decisions whether to eliminate him or not, what was the best interests of the group, and a storming of the building where Kyle was on the roof by some aggressive militants. While the screenplay and Eastwood take no explicitly political stands about the American presence in Iraq in its historical post-invasion sense, it shows the American SEALS and military devoted to their task, with spasmodic sympathy for the people whom they sometimes refer to as “savages”. What the film does do is focus, especially at the end, on the effect of war on the veterans, physical and psychological, after their return. For audiences who do not know anything about Kyle, there is a surprise ending, and a tribute to him. Whatever our political viewpoints, whatever our attitudes towards films about war, Clint Eastwood certainly knows how to make involving films. 1. A Clint Eastwood film? His career, films about war, immersing an audience in the experience of war, his perspectives on war, politics? 2. Topical film, actual characters and events, the 21st century, war story? Iraq and the Middle East? 3. The Texas sequences, the countryside, hunting and homes, rodeos? California, life? The detailed training for the Seals? Hospital and veterans? 4. Morocco as standing in for Iraq, the towns and cities, the aerial views, the streets, roofs, the ruins, the homes and interiors? The musical score? 5. Military activities in detail, command, men in the street, the snipers, the attacks, the enemy snipers? Guns, bombardments? 6. Injuries, deaths, the return to the United States, veterans and hospitals? 7. The title, the book, the production and the collaboration of Chris? His death in 2013? A different epilogue with the filming of his burial and content? 8. The opening, on the roof, Chris and the gun, the companion, the woman seemingly pregnant, the boy, then stopping, Chris’s diagnosis, the boy, shooting the boy, the woman getting the bomb, her death? 9. Chris is a boy, hunting with his father, the good shot, the killing of the deer, leaving his rifle on the ground and his father’s reprimand? His father’s affirmation, the meal, the discussion about sheep, wolves as bullies, sheepdogs? His interrogation about the fight on the playground, Chris as a sheepdog defending his brother? The belt on the table, his father saying that they must be sheepdogs and never wolves? The preparation for Chris as an adult, as a SEAL? 10. The adult brothers as cowboys, the rodeo, Chris and skills, his brother’s admiration, going home, the girl and the affair, her being ousted? 11. 1998, television views of the Al Qaeda bombings in Tanzania and Kenya? Television footage, Chris’s patriotic and emotional response, going to enlist, defending his country, the group, the expertise of the training,, the details of the training? SEALS as tough, willing? The spirit? Loyalties? 12. Chris in the bar, Taya and the married man, getting rid of, Chris talking, the repartee? The later phone calls, the dates, the proposal, marriage? The wedding sequence? Getting there appointments? 13. The visuals of 9/11, the impact in the film, the effect on Chris? 14. Taya, pregnant, staying at home, phone calls and hearing the action in Iraq? The distance, the effect of her pregnancy, Chris’s return, the ultrasound, driving away, turning back immediately the boy? The reticence of birth sequence? The boy growing up, the years passing, the daughter, Chris on leave, present and not present? 15. The character of tape or from offhand girl in a bar, to date, who growing older, the marriage, the children, a love the Chris, listening to on the phone, her grief when he returned from tours and was so detached, finding that he was more alive in Iraq and on tour? 16. The four tours? The development of war and resistance in Iraq? Insurgence? The American control? The clashes? 17. Chris as a sniper, his kills, the overview of his career? The setups, his accuracy, his nickname as Legend? 18. Chris is a person, his age, the experience of war, the effect of marriage, his fatherhood? Mentioning his father, his brother signing up, seeing his brother and his disillusionment, getting out? informant being killed? The peaceful meal, Chris finding the arms cache, the shootings, the funeral, the men in protest against the Americans? The little boy in the street, the victim of a sniper, picking up the weapon, Chris willing him to put it down? 20. The streets, search by door knock, the deaths, the Iraqi snipers, injuries and American deaths? 21. Chris at home, meeting the veteran he had saved and had lost his leg, thanks? Biggles, his being shot, in hospital, Chris’s visit, his death? Meeting the veterans? Chris going out with the veteran, the veteran killing him? 22. Action, on the roof, the wall with the gate, the sniper killing the Americans, at the wall, their looking in the wrong direction? The long distance, Chris taking him out? The orders not to, his comrades encouraging him? The invasion of the many soldiers, into the building, the fight, the shootings, the helicopter, the sandstorm, Chris and their holding the helicopter, his escape? screenplay not being explicitly anti--Islam? Koran and Bible? Chris proud, ready to meet his meet his creator? 25. His whole life before him, the irony of his being killed by a soldier? The epilogue ceremonies, ritual and salute?